The beginning of the year always brings a period of reflection for the year prior and looking forward into the next. 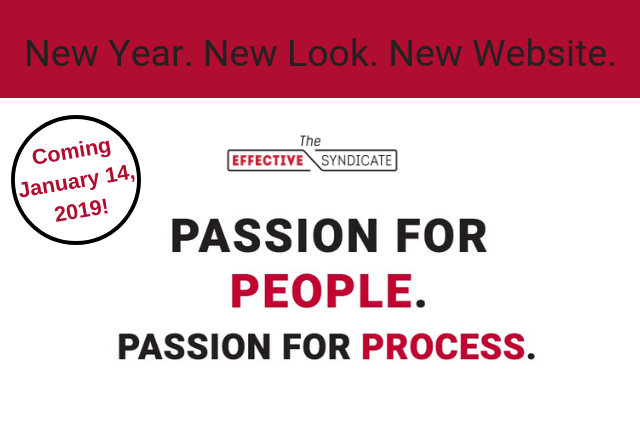 At the Syndicate, we had a simply amazing 2018 and we helped our clients recover Millions of dollars while also enhancing the lives of many employees. To say we have been fortunate or blessed is a great over-simplification. We have had the chance to work with some amazing companies, make great friends along the way and as always, continued to learn and grow. As we ease out of the little period of Holiday slow-down, I’ve been spending a lot of my time feeling grateful and counting the many blessings I have received. I can’t believe it was 3½ years ago that I decided to take the leap away from Corporate America and venture out on my own, but WOW I am so glad that I did. We have a lot planned for 2019. Last summer, Tim and I decided to give our company branding and website a complete refresh, along with a more coherent content strategy to help us spread the word and reach more people. It was the perfect opportunity to think about what’s most important to us and our customers, recommit ourselves to our mission, and explore new ways to reach our target audience and engage existing customers. We’ll launch our new website and introduce our new branding on Monday, January 14, while beginning to offer a more comprehensive and thorough collection of information intended to help people on the journey of Continuous Improvement. We have made some great relationships in 2018 that will certainly carry-over and expand into 2019 as we take our business to the next level. We have other exciting news coming soon—but for now, Happy New Year! Please check out the new site on January 14th!